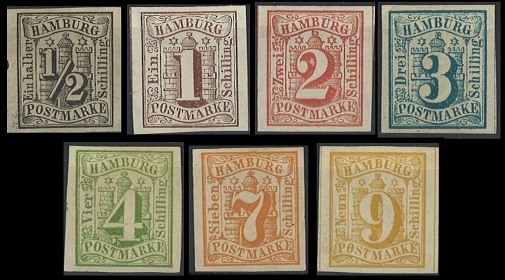 German states stamps for the Free City of Hamburg were first issued on January 1, 1859. 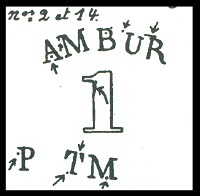 The seven new Hamburg stamps featured a central vignette containing the city arms, with a negative denomination numeral super-imposed over them. Except for the colors and denomination numerals, the attributes of the new postage stamps are identical. They are all typographed on medium thick, watermarked paper, they are imperforate, and they all have brownish gum. The paper used to print Hamburg stamps is watermarked with a serpentine wave watermark, contained in a framed box around the outer edges of the sheet. The image, above left, which is not to scale, shows the effect of the wavy lines crossing the sheet, with the boxed borders at the outer edge. On rare occasions, if the paper is shifted during printing, a portion of one of the border lines may show at one of the outer edges of the stamp. On most of the individual stamps though, only a portion of the "wave" may show. 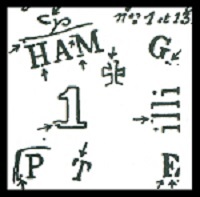 The image, above right, shows what an individual stamp may look like, when it is immersed in watermark fluid. In some rare cases, the paper may be shifted during printing to the extent that NO WATERMARK SHOWS AT ALL. In this case, one must rely on the plating characteristics of the plates used for printing the stamps. In fact, examiners almost always plate these stamps, as there are rare reprints that occur on watermarked paper. ½ Sch. (Mi. #1, Sc. #1) - Black. 1 Sch. ( Mi. #2, Sc. #2) - Medium to Dark Reddish Brown. 2 Sch. ( Mi. #3, Sc. #3) - Orange Red to Dark Vermilion. 3 Sch. ( Mi. #4, Sc. #4) - Prussian Blue. 4 Sch. ( Mi. #5, Sc. #5) - Dark Yellowish Green and Dark Greenish Olive to Bluish Green. 7 Sch. ( Mi. #6, Sc. #6) - Yellowish Orange to Orange. 9 Sch. ( Mi. #7, Sc. #7) - Dark Orange Yellow. 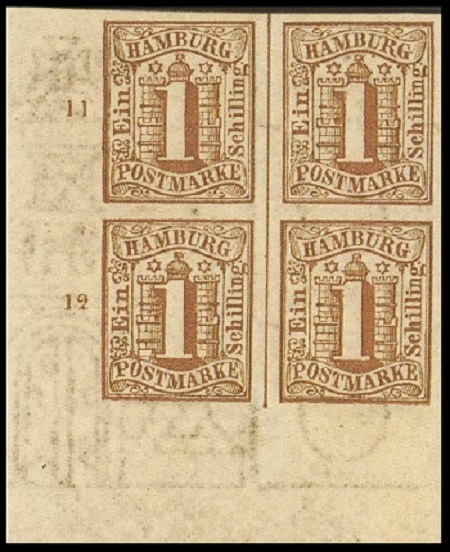 The spacing between the 1859 imperforate stamps of Hamburg was quite large, especially horizontally. There are also vertical dividing lines between the columns within the sheet. These attributes can be seen in the examples shown above. 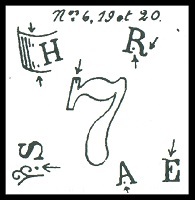 The spacing between the positions on the printing plates was 1.5 - 1.8 mm vertically and 3.6 mm horizontally. 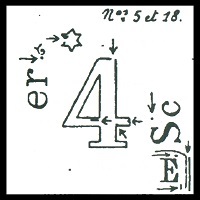 The Michel catalog recommends collecting these imperforate stamps with at least one of the horizontal and one of the vertical margins being equal to or exceeding 1.5 mm, or with the vertical separator line showing in one of the horizontal margins. THIS IS VERY IMPORTANT! These same plates were used to print the same line perforated 13 ½ stamp denominations of 1864 - 1867. Many people, over the years, have trimmed the perforations off these stamps and have represented them as being the 1859 imperforate issues. 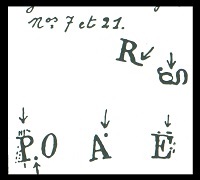 Thus, any stamps not exhibiting the conditions noted above are very likely the 1864 - 1867 perforated stamps that have been trimmed to resemble the 1859 imperforate stamps. Generally speaking, if an imperforate stamp of the 1859 issue shows a watermark, and it has ample margins, it is probably authentic. Though this presumption is widely accepted, it can, in some cases, be a dangerous practice. To make things a lot more technical here, each of the 1859 imperforate stamps has plate characteristics that are NOT PRESENT on the known forgeries. 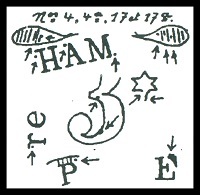 Some people refer to these as secret marks, but this is a misnomer, as they were not intentionally placed there by the plate engravers. Drawings of the plating characteristics of the ½ Schilling through the 9 Schilling denominations are shown in the graphic images below. These attributes are also applicable to the perforated 13 ½ stamps of these same denominations issued during 1864. (in other words - GARBAGE)! 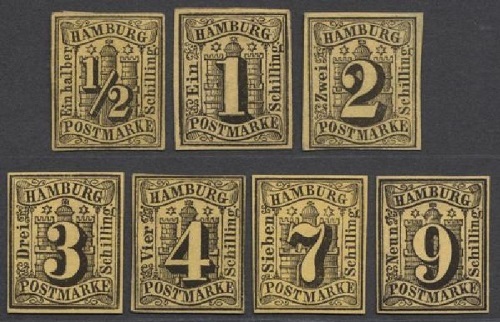 The stamps shown in the scan above, printed in black on golden-yellowish paper are not actually Hamburg postage stamps. Yet, these beautiful stamps are very desirable and quite collectable. In the Michel catalog, they are footnoted following the 1859 listings, with a valuation of about €100.00 each. 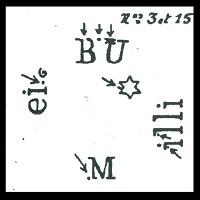 These are referred to as "Instruktionsmarken" or "Instructional Stamps". These were affixed to packages of new stamps being shipped from the printers to the main post office to identify the denomination of the postage stamp sheets contained in the packages. In addition to the sheet-sized-boxed serpentine watermark described at the top of this page, there is another watermark located in the marginal area of the sheets that is never encountered. In the very left outside margin of the sheet there is a watermark image which shows the castle used in the vignette design of the printed stamps. It is about 2-3 stamps high and about 2 stamps wide. One extremely rare occasions, a small portion of this hidden marginal watermark might show on marginal multiples, where the watermarked paper was accidentally shifted during printing. The bottom-corner block of the 1 Schilling denomination, shown above, clearly shows the ENTIRE marginal castle watermark. It is clearly seen at the lower left side of the paper, with the normal, boxed, serpentine watermark beginning just along the right edge of the first column of stamps. It is believed that only two such corner margin blocks, showing the entire castle watermark, might exist This one is the only such block that has been seen in the philatelic market in the last 20 years. This block was Lot #63 in the September 12, 1985 Heinrich Köhler auction sale of part of the Boker collection. With a reserve of only DM 6,000 ( about $2,000 US Dollars ), the lot went UNSOLD! John Robert Boker, Jr. (1913-2003), from New York City, was a philatelist who amassed the most prestigious collection of worldwide 19th Century classic postage stamps ever seen. His German States stamp collection is considered the most extensive ever assembled. That collection was so extensive that it required 18 auctions, over a period of 5 years, to sell all of his German States stamps. Since the block above was unsold, I wonder where it is now? Did one of Mr. Boker's relatives wind up with the collection remainders? Maybe it has been in someone's garage loft all these years. Maybe, after his death, one of his relatives just threw the albums in the trash. Who knows? Having not been seen on the market in the last 20 years, it is possible that this gem, which could probably realize millions of dollars on today's market, has been lost to philately forever!